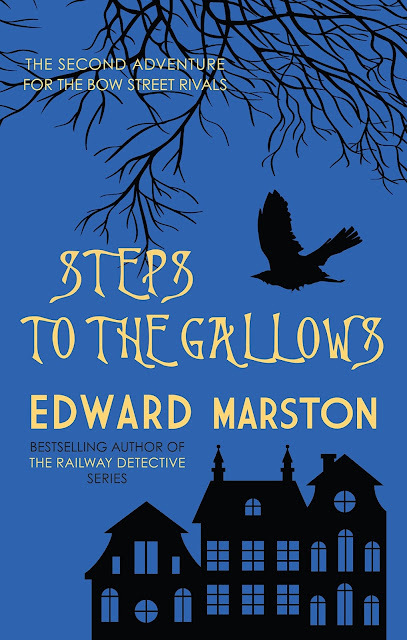 Steps to the Gallows (Allison & Busby) is Edward Marston’s second boisterous adventure for Peter and Paul Skillen. Those identical twins are more-than-capable “thief-takers,” but when it comes to bodyguarding, they’re less than perfect. As this tale commences, it’s 1816, in London, and Leonidas Paige—an ex-soldier who has turned to the enemy-making enterprise of satirizing lawmakers and other pompous personages in newspapers and cartoons—has become worried for his safety. So he employs the Skillens and their associates to watch his back. Despite such protections, Paige is soon garroted and his lodgings set ablaze. The brothers, upset that they could not safeguard their client, commit themselves to identifying and bringing down his murderer. To do that, though, will require their watching over the stubborn and capable woman who’d peddled the deceased’s work; finding the artist who’d helped Paige lampoon his targets; investigating an assortment of prosperous men upset by their treatment at Paige’s hands; figuring out how to assist a prisoner under threat escape from his cell; and fending off their arrogant rivals in crime-solving, the Bow Street Runners. To bring this case to its conclusion, the siblings will also rush away to Paris, where Paul fears his actress inamorata may be in danger from a lecherous villain. Marston (aka Keith Miles), author of the Nicholas Bracewell mysteries and the Railway Detective series, in addition to last year’s debut for Peter and Paul Skillen, in Shadow of the Hangman, offers a sharp wit, prodigious plotting skills, and a manifest appreciation for historical atmospherics in his novels. Such delightful storytelling! 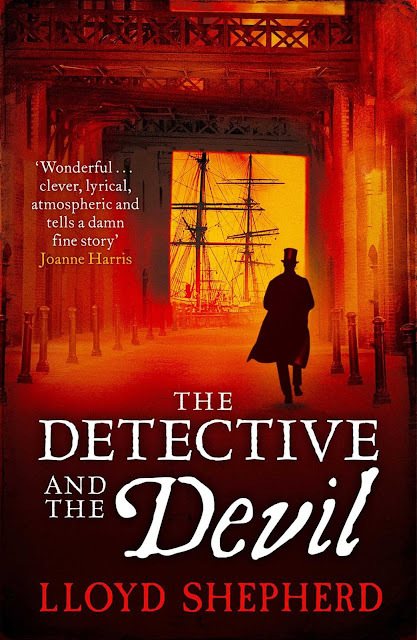 Skip back one year, to 1815, and you have the time period in which the events in Lloyd Shepherd’s The Detective and the Devil (Simon & Schuster UK) take place. Constable Charles Horton from London’s Thames River Police Office is summoned to the city’s East End to probe the gruesome slaying of a family, headed by a man who clerked for Britain’s East India Company. Horton’s persistent inquiries raise the hackles of that company, which is powerful enough and far-reaching enough in its political influence to shut down any threats to its reputation. They also bring the policeman into contact with the early 19th-century world of pseudo-science and the supernatural. Might the present homicides be connected to the looting of an alchemist’s library, as well as to the peculiar deaths of East India Company employees handling business with the tropical island of Saint Helena? The search for answers will send Horton and his wife, Abigail, off to the South Pacific in pursuit of a potentially demonic killer. Shepherd, who first made his name with the historical thriller The English Monster: or, The Melancholy Transactions of William Ablass (2012)—in which Charles Horton was introduced—delivers in this new novel (his fourth) a captivating blend of superstition and commercial subterfuge, enriched further by references to French former emperor Napoléon Bonaparte and the 1811 Ratcliffe Highway murders. Never read any Edward Marston books but you've sold me. I just ordered Shadow of a Hangman from my local bookseller. So excited to begin this new series. Thanks for another terrific review Jeff!